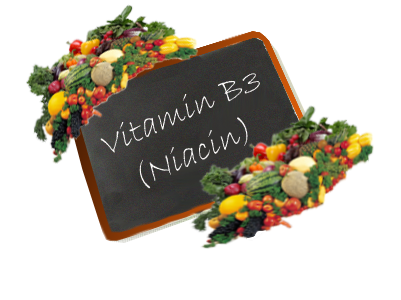 Why do people take Vitamin B3 ( Niacin, Nicotinic acid )? As a cholesterol treatment, niacin has strong evidence. Several studies have shown that it can boost levels of good HDL cholesterol and lower triglycerides as well or better than some prescription drugs. Niacin also modestly lowers bad LDL cholesterol. It's often prescribed in combination with statins for cholesterol control, such as Crestor, Lescol, or Lipitor. However, niacin is only effective as a cholesterol treatment at fairly high doses. These doses could pose risks, such as liver damage, gastrointestinal problems, or glucose intolerance. So don't treat yourself with over-the-counter niacin supplements. Instead, get advice from your health care provider, who can prescribe FDA-approved doses of niacin instead. Niacin has other benefits. There's good evidence that it helps reduce atherosclerosis, or hardening of the arteries. For people who have already had a heart attack, niacin seems to lower the risk of a second one. In addition, niacin is an FDA-approved treatment for pellagra, a rare condition that develops from niacin deficiency. Niacin has also been studied as a treatment for many other health problems. There's some evidence that it might help lower the risk of Alzheimer's disease, cataracts, osteoarthritis, and type 1 diabetes. However, more research needs to be done. How much vitamin B3 do we need? In the UK the adult RNI (Reference Nutrient Intake) is 17mg a day for men and 13mg daily for women. An additional 2.3mg daily is recommended for breastfeeding women but in reality there is no need for any additional vitamin given it can be made from the tryptophan in dietary protein. The European Union (EU) RDA suggests 18mg a day as a recommended daily amount for adults. One of the major roles of the B complex vitamin's niacin is in the regulation of cellular respiration and in promoting the proper utilization of all the major nutrients at the cellular level. At least forty different bio-chemical reactions have been identified as being controlled by two co-enzymes, both of which require niacin for proper functioning. There is no doubt that the vitamin niacin is among the most important bio-chemical factors in maintaining optimum health levels in the human body. One major role of the vitamin B3 is as a mild vasodilator - an action that results in the widening of the diameter of blood vessels leading to a greater blood flow along the arterial or venous systems. 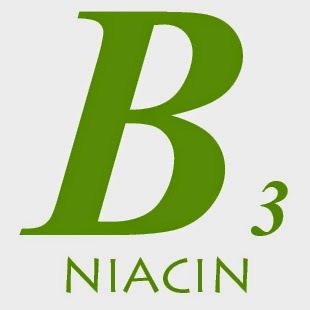 Vitamin B3 given at sufficiently high doses also induced a peculiar reaction in the body known as the “niacin flush”, besides reducing high blood cholesterol levels - during this reaction termed the "niacin flush," the temperature of the skin increases, there is reddening of the face, followed by a temporary drop in blood pressure. Spells of dizziness may also affect the person. The mobilization of fat reserves from the tissues is also inhibited by high doses of niacin. Niacin's inhibition of fat store mobilization has health implications for people on a diet, athletes and long term alcoholics, as well as people affected by heart disease. The opposite effect is induced by alcohol; this compound actively mobilizes fat from the tissues putting most of the fat so mobilized into the blood stream, the increased blood fats all go to the liver in the end. The livers of animals given extremely high doses of niacin were studied following the administration of alcohol - the supplements of niacin prevented the accumulation of fat in the liver of the tested animals. The liver is without a doubt protected by the actions of niacin, in fact this is a protective action afforded by many of the other B vitamins. However, the practicality of such high doses of niacin as used in the experiment is questionable and will not work on human beings, as high doses of the vitamin can induce other symptoms which may be less than beneficial to the person. The alcoholic consumption of a person may be too high, if such high doses of niacin are necessary to protect the liver from the effects of alcohol - in addition, alcoholism has other effects on the body which cannot be solved by vitamin supplements at any dose. At the same time, in the tested animals, the high doses of niacin actually kept the alcohol in the blood for a longer time than normal. Thus, there is a distinct trade off, and exposing the other organs and tissues to high levels of alcohol for longer period of time may not be worth the little protection the liver gains. Animals that were given large doses of niacin - as niacinamide, another form of niacin - experienced an increase in the amount of rapid eye movement (REM) sleep - REM sleep is the most restful state of sleep in mammals. But such high dosages are all but impractical for humans and the effect on have little relevance to the correction of sleeping problems in otherwise healthy individuals. This beneficial effect of niacin on sleep disorders may however, have strong implications in the treatment of people suffering from some form of mental illness. Pellagra is the oldest known deficiency syndrome related to a deficiency of niacin in the diet. Each cell in the human body may be affected by a deficiency of niacin, as niacin's plays vital roles even in the most basic of biochemical reactions at the cellular level. Pellagra mainly affects three major "target" organs - these are the skin, the nervous system and any area along the gastrointestinal tract. Research indicates that a prolonged deficiency of niacin can bring about a more or less permanent state of dependency for the vitamin or cause a greatly increased requirement for the vitamin in the diet. Pellagra caused by niacin deficiency results in the "3-Ds" symptoms, the D standing for each individual symptom. These are dermatitis, diarrhea and dementia. Symptoms of dermatitis induced by pellagra can partly resemble the symptoms of other B vitamin deficiencies - the person has a swollen and bluish tongue coupled with inflammation in the mouth and around the lips. These symptoms of pellagra are the least and smallest manifestations affecting the skin of the person. The person's skin can turn a deep red color, infected and affected by blisters and fissured, scaly or hardened. Such symptomatic skin lesions normally appear on affected areas of the skin that are normally exposed to strong sunlight or to physical trauma. The most common areas that are affected include the elbows and the knees, the skin on the back of the neck and the hands as well as the skin on the forearms. There may be soreness in the mucous membranes of the mouth, this area can be ulcerated and eventually start to hemorrhage as the ulcers cracks up. In a similar fashion, such symptoms are also seen in the mucous membranes along the gastrointestinal tract. Some other symptoms that can result include a reduction of the digestive secretions along with a persistent burning sensation and gastric discomfort, this is followed by abdominal distention, persistent flatulence and an occasional bout of vomiting that gives way to severe diarrhea. The nervous system is affected similar with symptoms which can cause a lot of distress to the affected person. Physical symptoms that initially appear include mild but persistent mental anxiety, strong and constant apprehension, physical and mental fatigue, a sudden loss of appetite, hypersensitive skin, problems with digestion, persistent headache and insomnia, mental tension and alternating bouts of depression and hyperactivity. Some of these symptoms worsen over time and can progress to general irritability, prolonged emotional instability and different psychotic symptoms can come about including hallucinations, mental confusion, disorientation and paranoia, delirium and mania, impaired vision and perception, a hypersensitivity to light, the development of a hyper acute sense of smell, the dulling of the sense of taste, and severe and long term depression. Niacin deficiency can also induce the manifestation of a group of symptoms quite distinct from the symptoms of pellagra. The person can be affected by some of the less severe symptoms of dermatitis, they can experience a strange clouding of consciousness, the development of a "cogwheel" rigidity in the extremities, there could be uncontrollable grasping and sucking reflexes all of a sudden, in some cases patient may enter a comatose state. Such physical and psychological symptoms normally affects people who are hospitalized and are being undergoing intravenous feeding on liquid foods that are without supplemented vitamins. 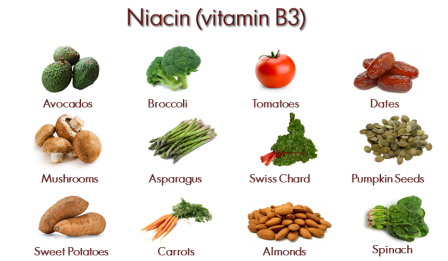 Niacin (vitamin B3) actively causes dilation in the blood vessels, leading to a temporary lowering of the blood pressure and appears to positively lower blood cholesterol levels when they are high. However, the use of niacin is surrounded by a certain amount of controversy especially regarding its supplemental use in the treatment of people affected by heart disease. The blockage of blood vessels is the primary problem in people affected by heart disease. There is a beneficial effect from any factor that results in the widening of the blood vessels and the restoration of circulation. The risk of developing heart disease is also heightened by elevated levels of blood cholesterol and persistent high blood pressure. Thus there is potential benefit for any single factor that can lower the blood pressure or lead to the reduction in total cholesterol levels. At least theoretically, people with heart disease seem to be benefited by supplements of niacin. An abnormal electrocardiogram seems evident in most victims suffering from pellagra - this indicates that they suffer from an abnormal functioning of the heart. When such deficiencies are treated using niacin supplements, these abnormalities start to disappear by themselves and the person recovers from the deficiency. People who have very bad dietary habits are prone to suffer from a niacin deficiency. Individuals who are also susceptible to a niacin deficiency include people who consume low-calorie and low-protein, or high-fat and carbohydrate rich diets for long periods of time. Susceptible individuals include alcoholics and people affected by diseases that interfere with the proper digestion and absorption of food - this category of individuals at risk includes those who suffer from any form of chronic diarrhea, those affected by liver cirrhosis and those who are affected by tuberculosis. Individuals deficient in levels of pyridoxine (vitamin B6), which is essential to the bio-chemical conversion of the amino acid tryptophan to niacin, may suffer from a deficiency of niacin as a secondary effect. Individuals affected by Hartnup's disease have an increased metabolic requirement for niacin to prevent the development of pellagra; this inherited disease is marked by a defect in the bio-chemical conversion of tryptophan to niacin. Each of these forms of vitamin B3 is used for schizophrenia, hallucinations due to drugs, Alzheimer’s disease and age-related loss of thinking skills, chronic brain syndrome, depression, motion sickness, alcohol dependence, and fluid collection (edema). Some evidence suggests that niacinamide (but not niacin) might help delay the time that you would need to take insulin in type 1 diabetes. In type 1 diabetes, the body's immune system mistakenly attacks the cells in the pancreas that make insulin, eventually destroying them. Niacinamide may help protect those cells for a time, but more research is needed to tell for sure. The effect of niacin on type 2 diabetes is more complicated. People with type 2 diabetes often have high levels of fats and cholesterol in the blood. Niacin, often along with other drugs, can lower those levels. However, niacin may also raise blood sugar levels, which is particularly dangerous for someone with diabetes. For that reason, anyone with diabetes should take niacin only when directed to do so by their doctor, and should be carefully monitored for high blood sugar. Vitamin B3 ( Niacin, Nicotinic acid ) comes in two basic bio-chemical forms called niacinamide and nicotinic acid - simply known as niacin in day to day use. Niacinamide is the form of the vitamin commonly met with in the body of animals, while niacin tends to be sourced from plants. Niacin is rapidly converted into the niacinamide for inside the human body. The chemical form niacinamide is similar to niacin in all parameters and performs similar functions in the human body, with the exception that it does not induce vasodilation or the niacin flush in the person using the vitamin. A large variety of supplemental doses of both niacin and niacinamide are available in the market, these dosages range from a few milligrams to 1000 milligram tablets or capsules. Niacin is found in abundance in natural form from organ meats, yeast and fish, nuts and whole grains, leguminous plant foods like dried peas and beans. The amino acid tryptophan is found in large amounts in corn, niacin can be synthesized from this amino acid by the body, and however, the tryptophan found in corn is chemically "bound" and cannot be utilized by humans. Corn is subjected to alkali treatment for the kernels to release the tryptophan, which is then used in various proteins as well as in the synthesis of niacin. Substantial losses of niacin occur during the process of cooking or boiling foods as the vitamin is soluble in hot water - there is no way to prevent this loss, though it is a good idea to eat natural foods in a raw state to get at the vitamins. Western societies of today are largely free of pellagra, the main disease induced by a deficiency of vitamin B3. Generalized physical symptoms induced by pellagra can include the complete loss of appetite, a persistent skin rash, prolonged diarrhea, changes in the mental state of the person, the development of a beefy tongue and problems with digestion as well as severe emotional disturbance leading to psychologically altered states of mind. Researchers are studying topical forms of niacin as treatments for rosacea, aging, and prevention of skin cancer, although it's too early to know whether it is effective. There is almost no safety issue regarding the supplement use of niacinamide, however, some people have experienced in rare cases physical symptoms affecting the liver, when the vitamin is taken at doses that exceed 1,000 mg of the vitamin daily. Physical symptoms such as flushing of the face, persistent headache and a bad stomach pain is also seen in some people who used niacin supplements in amounts that were as low as 50 - 100 mg a day. To correct some kinds of health disorders, certain doctors at times prescribe very high doses of niacin - some doses can even exceed 3,000 mg daily or more. Physical symptoms such as liver damage, diseases like gastritis, damage to the eyes and even elevation in blood levels of uric acid are induced by high doses of niacin - uric acid accumulation in the body causes the diseased state called gout, and niacin must never be used in very high doses without first consulting a nutritionally oriented doctor about the risk of high doses and its effects on uric acid metabolism. While no side effects are connected to the use of the inositol hexaniacinate form of niacin, the number of research projects that have been carried out in studying the safety of this form of the vitamin remains low and more clinical studies will shed a light on any safety issue concerning the use of this vitamin. The use of this form of niacin supplement in large amounts by some people - who often take in excess of several thousand milligrams daily - must be monitored and studied by a nutritionally oriented doctor to assess the safety of such high dosages. At the very high doses used to lower cholesterol and treat other conditions, liver damage and stomach ulcers can occur. Your health care provider will regularly check your liver function through a blood test. People with a history of stomach ulcers should not take niacin supplements. Those with diabetes or gallbladder disease should do so only under the close supervision of their doctor. People with coronary artery disease or unstable angina should not take niacin without their doctor’s supervision, as large doses can raise the risk of heart rhythm problems. Niacin and niacinamide might make gallbladder disease worse. Large amounts of niacin or niacinamide might bring on gout. Niacin or niacinamide might increase liver damage. Don’t use them if you have liver disease. Niacin might accumulate in people with kidney disease and cause harm. Don’t use them if you have kidney disease. Niacin or niacinamide might make ulcers worse. Don’t use them if you have ulcers. Taking any one of the B vitamins for a long period of time can result in an imbalance of other important B vitamins. For this reason, you may want to take a B complex vitamin, which includes all the B vitamins.